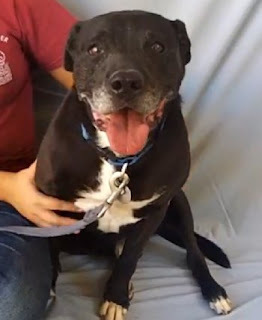 Griffie is an 11 year old Labrador Retriever who was left at the shelter by his owner with another. The other dog was adopted and Griffie is looking for a place to crash. He's house-trained, as gentle as can be, and just loves to be held. He's low-energy, so he's perfect for older folks who are looking for a mellow pet that is happy to get out for a few leisurely walks each day. He's got great leash manners. He's great when he's around people, but being in the kennel is taking its toll on him. He gets along with everyone, including other dogs, cats, and children. He's had all of his shots, has been neutered, and doesn't have any other health issues that anyone can tell. Given a second chance, he's the perfect addition to any pack. He's in Los Angeles County, but for the right home, he'll be transported within Southern California. He's currently at the Castiac Shelter.